What are my content choices? 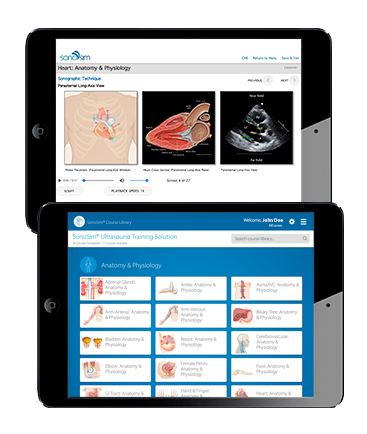 The SonoSim® Content Library contains the largest collection of hands-on training cases in the world. The Content Library is organized into individual SonoSim® Modules. Each Module delivers expertly created hands-on training cases, didactic instruction from leading educators, and detailed knowledge assessment on a particular topic. Modular Format. Each module delivers a course, knowledge assessment, and hands-on training cases. What Types of Modules are Available? The SonoSim® Ultrasound Training Solution is approved for AMA PRA Category 1 Credit™. Individuals can obtain continuing medical education (CME) by completing designated CME-accredited Courses.